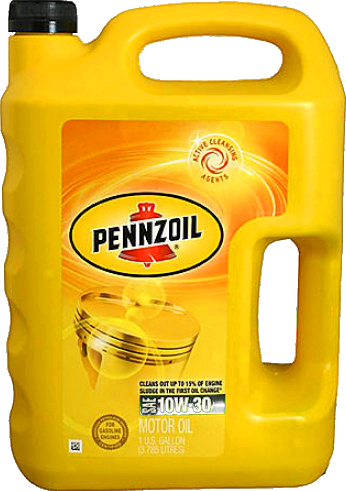 Motor oils come in a variety of types, and are usually naturally extracted from crude oil. Many of an engine's components need to be oiled in order to prevent wear, overheating, and power loss. It it also preferred over other oily substances because of its durability in the harsh heated conditions within an engine. Engines have a lot of parts that rub against each other, which creates friction. In order to reduce friction, lubrication in the form of motor oil is used. It also helps move heat away from the hottest points of the engine, and cleans out contaminants with the help of an oil filter. This is an example of recycled oil as it was sold in 2012 (50% natural, 50% re-refined). It is aimed at the environmentally-concerned market, but performs just as well as standard natural oil. Some oil grades are unusual for modern vehicles and are hard to find because of it, examples being 20W-30 and any 25W- formulation. Gear oils, although much thicker, use this same API rating system. The oil sits in the bottom of the engine, in the oil pan. When the engine is running, the oil pump pushes oil to the components which need it, and the oil eventually flows to the bottom of the engine to start the process again. Motorsport vehicles in general are put under a lot of stress, but the stress levels are ramped up considerably in the engine, so special high-performance oil has to be used to prevent the engine from burning it up. It is intended for racing use only, since normal driving doesn't warm racing oil up enough for it to be effective, and it has high levels of ZDDP in it, which can damage catalytic converters, a part typically not found on race cars. 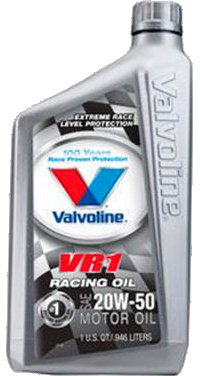 Pictured at the right is an example of a one-quart bottle of racing oil, Valvoline's 20W-50 Racing Motor Oil. It is a thicker type which can withstand the heat, pressure, and stress found in most moving parts within a racing engine. "Is it safe to switch between brands of motor oil?"